Donning a watch is a great way to stay on schedule; one must always rely on this perfect accessory to complement their honeymoon adventures and enjoy a carefree vacation. And when it comes to looking for good aesthetics, try investing in an antique piece for your bridal trousseau, especially if you are planning a trip outdoors as you will most probably spend some time running, climbing or skiing. 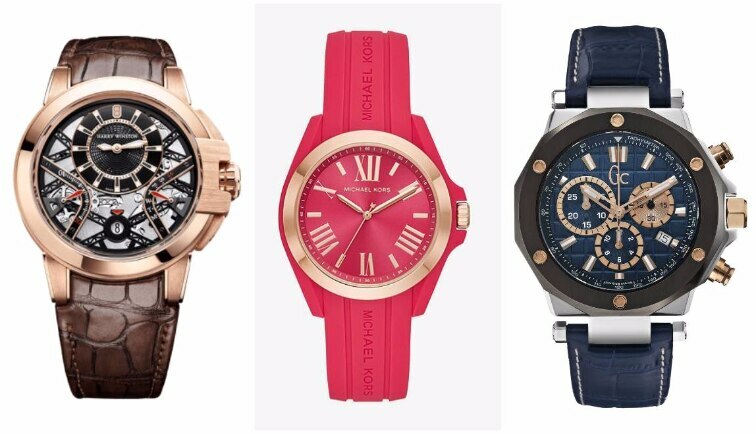 Scroll down for some amazing watches which are sporty as well as extremely stylish, and will make you feel tougher as soon as you strap one on your wrist. A timepiece with sporty silicone straps, this classic piece has Roman numeral time-stops finished with sleek rose-gold accents. So, if want to make a modern statement with your attractive holiday outfit, then this hot-pink watch is the perfect option. A smart luxury timepiece crafted with rich designs, this combination of striking blue and rose gold will give you a sporty-yet-elegant appearance. This ultra-slim watch is made with 18-k white gold and a bezel set with 2 rows of diamonds. Keeping in mind the desires of present-day women, this satin-strapped and water resistant timepiece can also be donned for your romantic dinner date. This sporty piece is inspired by the shape of classic navigational tools and bears all the hallmark aesthetic traits of Mr Winston’s timepiece collection. With brown alligator leather straps, this particular wristwatch is a good choice for all your sporty adventures. A contemporary sports watch, complemented with blue leather straps with quilted pattern and polished steel folding clasp with safety push-buttons. By blending together fashion and function, this timepiece is surely for the risk takers.